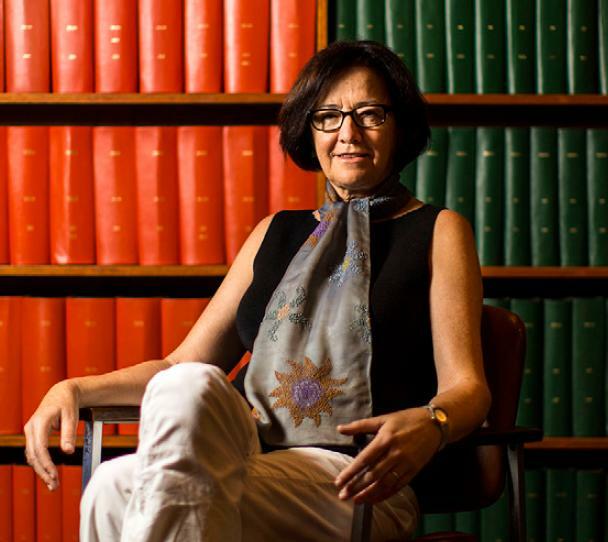 Margaret McFall-Ngai, professor and director of the Pacific Biosciences Research Center, School of Ocean and Earth Science and Technology, at the University of Hawai'i at Mānoa, is the only woman at UH who is a member of the National Academy of Sciences (NAS). In her inaugural article published this week in the Proceedings of the National Academy of Sciences, commemorating her induction into one of the country's most distinguished scientific groups, she and a team of researchers reveal a newly discovered mechanism by which organisms select beneficial microbes and reject harmful ones. The internal microbial communities, or consortia, of mammals, such as humans, are complex in that they require many bacterial types for healthy function. Tissues in the respiratory system, the Fallopian tubes, and the Eustachian tubes are lined with cilia–microscopic hair-like structures that extend out from the surface of many animal cells. A central role attributed to these ciliated tissues is to effectively clear out toxic molecules and undesirable microbes; in work performed largely by Dr. Janna Nawroth (now at Emulate, Inc., Boston) and co-led by McFall-Ngai and Dr. Eva Kanso, a mathematical modeler at USC, these ciliated tissues are shown to also selectively recruit beneficial microbes, called symbionts. "A few years ago, when the biomedical community discovered that all of these surfaces of mammals have a rich co-evolved microbial consortium, a microbiome, that promotes the health of those systems, the question became: how do they do it–that is, by what mechanisms do they select the good microbes and reject the harmful ones?" explained McFall-Ngai. The ciliated tissues of most animals are inaccessible to observation and study. Using the Hawaiian bobtail squid and its single bacterial symbiont, Vibrio fischeri, as a model biological system, the collaborative research team–comprised of a biomechanicist/bioengineer, an applied physicist, mathematicians, an imager, a microbiologist and McFall-Ngai, a developmental biologist and biochemist–investigated the process by which an appropriate symbiont species is recruited into a host animal's microbiome at the exclusion of all other bacteria. This model system provides a special window into such complex problems because the squid partners up with only one symbiont species, which it selects using the activity of a complex ciliated surface. In addition, the body plan of this animal is such that researchers can use microscopy to watch the process happen along this highly accessible tissue surface. "We were surprised to find two different cilia behaviors," said McFall-Ngai. "One behavior is typical of long cilia–very organized, with waves of cilia groups beating together. These fields of cilia serve to concentrate the bacterial partner into the areas where colonization will occur. We also found fields of short cilia that were beating, but each independently. The mathematical modeling and visualization showed that these shorter cilia serve to mix the chemical signals of the host cell so as to attract the partnering bacteria." Because the structure and function of cilia are conserved throughout the evolution of animals, this study provides insight into the very basic function of ciliated surfaces. "With this starting point, we can begin to determine how the whole system, host cells, their secretions and their bacterial partners, work to dissuade the colonization of these tissues by deadly pathogens, such as those that cause whooping cough, strep throat/ rheumatic fever, and two different types of pneumonia," said McFall-Ngai. "This information may also aid development of ways to foster the acquisition and growth of beneficial bacterial partners along human respiratory, reproductive, and excretory tracts." For nearly three decades, McFall-Ngai and PBRC researcher Edward Ruby, have used the squid-bacterial symbiosis system to characterize animal microbiomes. They discovered bacteria affecting animal development and bacterial partners driving circadian (daily) rhythms of their host. These and other insights have contributed to expanding the once narrow view of the microbial world. Based on her distinguished and continuing achievements in original research, McFall-Ngai, was elected to the NAS in 2015. Election to the NAS is one of the highest honors in the field of science.